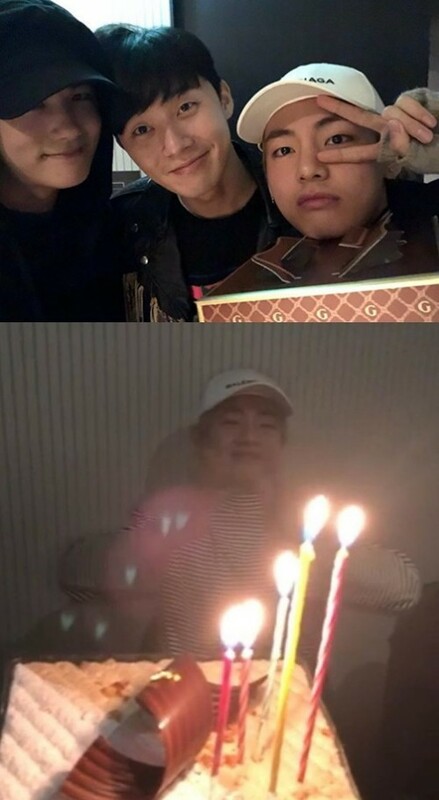 Actor Park Seo-joon, who starred in Yoon's Kitchen 2, snapped a picture with Park Hyung-sik and BTS member V.
Recently, Park Seo-joon posted the photo on his Instagram, and wrote, "I took the glorious moments with the world's most handsome guy and the most handsome guy to me. - The review of the meeting." In the picture, Park Seo-joon is showing off his handsome features with V and Park Hyung-sik. What's catching attention is a birthday cake for V, whose birthday is December 30. Meanwhile, Yoon's Kitchen 2 starring Lee Seo-jin, Park Seo-joon, Yoon Yeo-jung, and Jung Yoo-mi will premiere on January 5.